This year’s Great ShakeOut Earthquake Drill is set for 10:18 a.m. on October 18. That’s the moment when people the world over are supposed to stop what they are doing and focus on keeping safe during a quake. More than 1 million people in Washington—more than 40 million worldwide—have signed up to participate. If you do take part, you are supposed to spend a minute at 10:18 dropping, covering and holding on—just as you would during an actual earthquake. What you really want to do is not just drop, cover and hold on, but give serious thought to all you can do to keep yourself and your family safe during an earthquake. Given the geology of Washington, you have to assume that earthquakes will occur. Most will probably be mild, but a quake emanating from the Cascadia Subduction Zone could be devastating. When people talk about the “Big One”, that is what they are talking about. But staying safe in any quake, big or small, requires advance planning and preparation. There is a mountain of preparedness material available, but a good place to start is the Red Cross Earthquake Application, available free online from both the Apple Store and Google Play. The app gives you plenty of useful information on what to do before, during and after a quake. First, you need to prepare for how you will live in those first post-quake days when power is out, roads are blocked and you must get by on what you have stockpiled at home. You want to have flashlights and radios with plenty of batteries—or maybe a hand-crank radio which needs no batteries to operate. And you will need provisions enough to feed your family until stores reopen. The Red Cross app suggests enough non-perishable food and enough stockpiled water (a gallon a day per person) to provide for the family for at least three days. Have enough sanitary supplies and enough of any prescribed medications to sustain you until life returns to normal. Second, you need to deal with anything in the house that could injure or kill people during a quake. Here, the Red Cross app provides a long list of things to do to quake-proof your home, and the teaching material issued as part of the Great ShakeOut offers some more. You should, for instance, bolt and brace water heaters and gas appliances to wall studs to keep them from falling over in a quake. Any tall pieces of furniture—bookcases, china cabinets and the like—should always be bolted to wall studs to keep them from being pulled over by children. Ikea for one, offers wall-mounting hardware with its furniture. If you haven’t done this so far, do it now as part of preparing for a quake. Also anchor overhead lighting fixtures to ceiling joists. Put strong latches on all cabinets to keep the contents from crashing out in a quake. Some of this work will require a construction professional. Have the person examine your whole house for potential trouble spots. Are sliding glass doors, awnings and canopies, car ports, porches and decks all secure enough to survive a quake? Is your home securely anchored to the foundation? Great ShakeOut literature suggests a ”hazard hunt” for potentially dangerous objects around the house—things that could fall and injure people. Place heavy objects on lower shelves so no one is hurt if they fall. Take down pictures or mirrors that have been hung above places where people sit or sleep. Finally, the Red Cross app suggests you learn how to shut off all gas valves in the house and keep a wrench handy so you can close the valves in a hurry. Next, you want to know all that you can do to ensure your personal safety while the quake is going on. That’s where drop, cover and hold on comes into play. At the very first tremble, drop to your knees, crawl under a table or desk to protect yourself from falling objects and hold on to something sturdy until the quake ends. If there is nothing to crawl under for cover, stay against an interior wall with no windows. If you are in bed, curl up and stay there and cover yourself with whatever is at hand. A pillow is better than nothing. Don’t venture outside until the shaking stops. If you must leave a building, only use the stairs. Elevators may be out of service or damaged and hazardous from the quake. Before leaving the building, look around and up to be sure there is nothing that might fall on you. Make sure you are okay before checking others for injuries. Check for any fires and put them out. Fires are the most common post-quake hazard. Your home should have one or more fire extinguishers and you should know how to use them. Check for damage to your home and get people outside if the damage looks severe. Beware of live electrical wires that have come down. Turn off electric power and leave it off until all downed power line are taken care of and until a professional says your electrical system is safe. Check gas lines and connections for leaks. Spray a mix of water and dishwasher soap on all gas fittings. Bubbles could indicate a leak. If you hear hissing from a propane tank, it could mean a leak. Call the fire department at once. Finally, assume the quake will be followed by one or more aftershocks. You dropped, covered and held on during the first shock. Do exactly the same at each aftershock, until you are absolutely sure the whole episode is over. 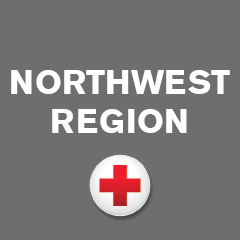 The Red Cross and the Great Shakeout want everyone to be aware of and prepared for the threat of earthquakes throughout the Northwest Region. We invite you to contact your local Red Cross to see what FREE preparedness education and resources are available in your community. For more information, please visit: RedCross.org.